Dead cabbage palms due to salt intrusion - one of the end results of erosion. Protected sea turtle nest on the brink of washing away from the eroded shoreline. The Fort Dade power plant/Mess hall, once at the center of the island, is now surrounded by Gulf waters. 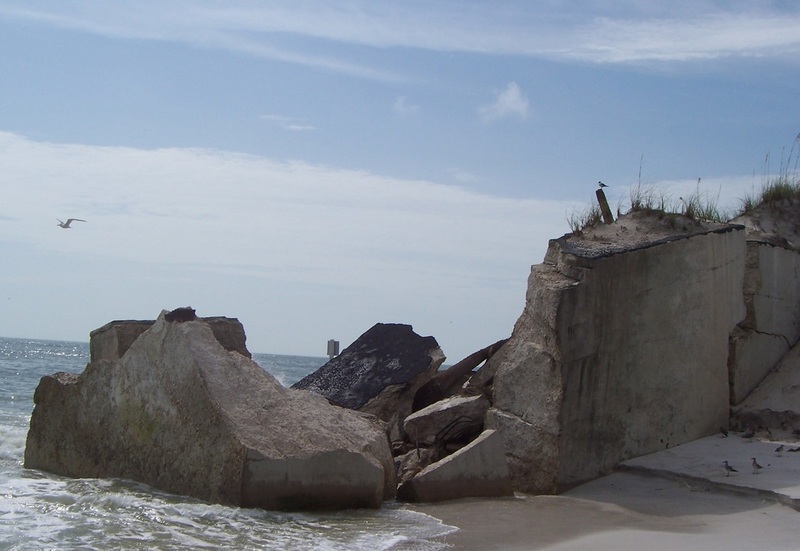 The extent of erosion in 2005 prior to USACOE restoring the shoreline through O&M project. 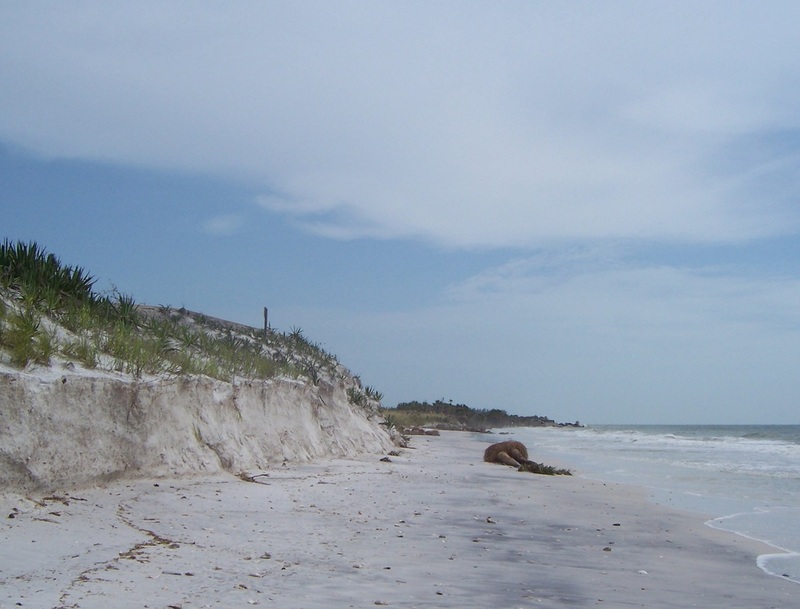 Erosion is threatening the very existence of Egmont Key. has already claimed too much of the beachfront that many wildlife species need to survive. Historical structures dating back to the Spanish-American war are also being lost. Tampa Bay residents are all too familiar with the effects of erosion, having lost nearby Passage Key, another important Tampa Bay Refuge for migratory birds, only a few short years ago. Why we CAN’T lose Egmont Key! Egmont Key is owned by the citizens of the United States, that’s probably YOU. Established as a National Wildlife Refuge in 1974, it protects a diverse community of animals and plants, many of which are either threatened or endangered. It is an essential stopover for migrating and wintering birds, gopher tortoises and box turtles, and endangered loggerhead sea turtles. The Egmont Key State Park overlay of the Refuge provides 24-7 on-site management and further assists in the Key’s protection. Egmont Key boasts a cultural history tracing back to the early 1500’s with the Spanish exploration of the Tampa Bay area. In 1858 a still-functional lighthouse was rebuilt following storms and a hurricane, replacing the original 1848 structure. Forty years later the island became the Fort Dade Military Reservation charged with protecting the Bay from invasion during the Spanish-American War. The island’s buildings, gun batteries, and brick roads reinforce the island’s strategic positioning at the mouth of Tampa Bay. key place in our nation’s and Tampa Bay’s cultural and military history. Don’t let erosion claim what is yours! Want to know more about what is at risk? Click here!